In 1989 the Mitchell Corporation released the brilliant Arcade game ' Pang ', which was later ported over to a multitude of systems by Ocean including the C64, Amstrad CPC, ZX Spectrum Amiga, MS-DOS and Atari ST. However it wasn't until this years Silly Venture 2016 event, that an Arcade port was announced and shown off for the Atari XL/XE. 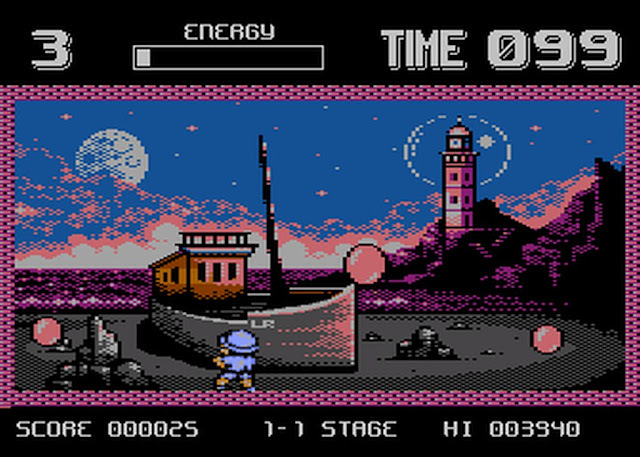 So yes finally Atari XL/XE owners who haven't seen the game yet will be able to play a rather special port, which was created by tebe, ooz, Vidol and stRing and coming first place at the event! In this up to two player game you have to destroy bouncing balloons terrorising global landscapes, but you have to be really careful as most of them when shot split off into smaller but even more balloons. Pang is a really good game to play and it didn't matter what system it was converted to, it was still just as enjoyable. There's nothing more satisfying than playing with friends, firing harpoons, popping balloons and picking up power ups for a more enjoyable experience.